It’s been wonderful to see the Wobage Makers Gallery so busy up to Christmas. Our final opening hours are Friday 21st and Saturday 22nd December, 10am- 5pm. Both Patia and Jeremy have both fired again subsequent to the Private View opening back in November, so there is still plenty of fresh and exciting new work to choose from. Also Kitchenwood by Ben Casson, baskets by Clyde Hoare, sculpture by Lucy Casson, pots by Sheila Herring. Why not escape the chaos of the High Streets and enjoy the quiet tranquility of shopping at Wobage for local hand-made gifts this Christmas! The Gallery is officially closed in January and February. However if you’d like to drop by for a browse or to purchase something specifically over this winter period, please don’t hesitate to give us a call and arrange a day and time. 01989 780495. Our course schedule for 2019 is now live and available for booking, horrahh! Please accept our sincere apologies for the protracted delay. There are three Improvers courses, all in July, aimed at makers with some previous experience in wheel throwing. The titles for these are ‘Thrown and Altered’, ‘Just Mugs!’ and finally ‘Jars’. 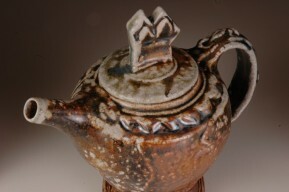 Each are three and a half days in duration and are tutored by Jeremy, using his buff stoneware clay. If you’ve any queries regarding any of the detail featured on each individual course, please don’t hesitate to get in touch. We have a busy year ahead, including a wood-salt kiln build, so regrettably we will not be running any two-day Beginners courses this season, sorry! Patia has been invited to demonstrate at the prestigious Aberystywth ICF (International Ceramics Festival) in early July, so she is taking a back-seat in her Wobage teaching for 2019. Those of you awaiting places on her popular Slip-decoration and Porcelain courses, will I’m afraid have to wait until 2020, we are sorry! The dates for Aber’ ICF are 5th – 7th July 2019, should anyone be interested in attending. You can join the Festival just for the day, or for the full long-weekend. For bookings or futher information on ICF click here! 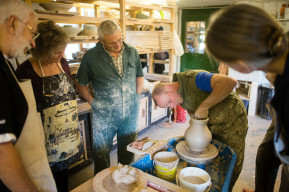 It is consistently a stunning line-up of clay demonstration and firing and a wonderful atmosphere amongst mudslinging enthusiasts world-wide. An unmissable event in the clay calendar! We are very much looking forward to the new Wobage mudslinging season in Summer 2019, to welcoming back familiar friends and new students alike.